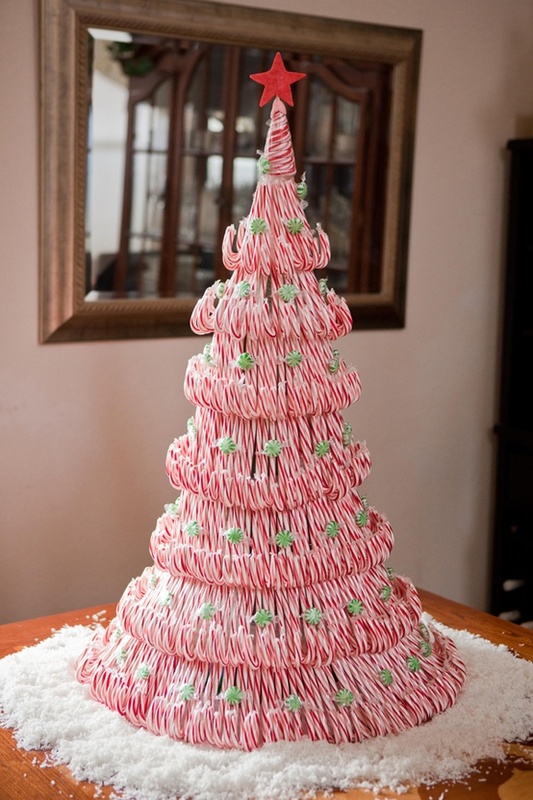 DIY Tutorial: candy cane tree centerpiece. excellent instructions as well as pics of all products used. Fairly simple too…Candy canes are just taped on styrofoam forms. Make sure you place the structure at the final display area so that you won’t have to move the entire tree later. Now, the fun begins! I realized too late that I shouldn’t have taken the plastic wrappers off the styrofoam circles, because I wanted to stick each unwrapped candy cane onto the circles with tape. The tape sticks better to plastic than to styrofoam. I will keep this in mind for next time! After each layer round is complete, make sure to double up the tape to prevent the candy canes from falling out of place. For the ornaments, we used green pinwheel candies (peppermint-flavored, just like the candy canes!) bought at the bulk section of our local Winco Foods grocery store. Stick a toothpick into the Starburst star, stick that into another softened Starburst shaped into a cone base, then put that on top of the tree… and TA-DA… We have a Candy Cane Christmas Tree! !